"BlacKkKlansman" feels like the movie Spike Lee always wanted to make. On the surface, he tells the story of Colorado Springs policeman Ron Stallworth, the first black detective on that force in the 1970s. Assigned to investigations, he answers an ad for the Ku Klux Klan. Using his "white voice," Stallworth convinces the local chapter of his desire to join. In a plot right out of "Cyrano de Bergerac," he recruits a white officer to take the meeting. Together the two investigate, infiltrate, and even meet Klan head David Duke. 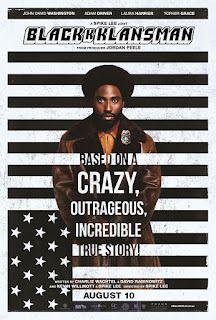 John David Washington plays Stallworth like a cross between "Shaft" and "Superfly." The son of Denzel Washington, John David has natural talent and charisma. Adam Driver plays his partner with a buddy cop vibe. Spike Lee bookends this true story with a primer on racism since the Civil War. His final montage uses footage from the demonstrations in 2017 Charlottesville, Virginia. "BlacKkKlansman" stays with you - a rare combination of comedy, outrage, history, and current events. BlacKkKlansman," rated "R," 3½ stars. Does it deliver what it promises? Thought-provoking spotlight on racism. Is it entertaining? Well done. Is it worth the price of admission? One of Spike Lee's best.